The Master of Laws (LLM) degree is a highly specialised qualification that takes an academic approach to complex aspects of many areas of legal practice, and can provide a specialist theoretical expertise in a niche area of law. While gaining an LLM is a worthwhile achievement in itself, it is not as valuable as being able to demonstrate your experience and practical skills to major law firm recruiters. There is, therefore, a substantial increase in the number of lawyers who appreciate that the transformed and evolving legal market requires lawyers to develop and provide an enhanced array of skills and expertise to their firms and clients. The new Qualified Lawyers Transfer Scheme – QLTS – introduced in England and Wales in September 2010 – unlocks the opportunity for lawyers just like you to become a dual-qualified English solicitor through a fast-track route for qualification, without undergoing an internship, traditional training contract or fulfilling any experience requirement. The QLTS is the official transfer scheme of the Solicitors Regulation Authority (SRA), which is the regulatory body of the Law Society of England and Wales. It is specifically aimed for international lawyers seeking admission to the Roll of Solicitors. Dual qualification as an English solicitor through the QLTS means you gain a prestigious and internationally recognised qualification and allows you to demonstrate both your academic and practical prowess. English law is always held in high esteem; London is among the leading legal centres in the world; and as a dual-qualified lawyer, you will be a valuable and trusted international legal advisor. You also develop, to a high standard, the practical skills a lawyer requires. These practical skills include: legal knowledge and application, research and analysis of fact and law, time management, verbal and written communication and the provision of legal advice in a commercial context. The practical skills of a dual-qualified lawyer mark you out as an outstanding legal adviser, but are not restricted solely to the legal profession – organisations across all sectors value the commercial aspects you gain by acquiring these transferable skills. Further, the practical advantages of dual qualification presents opportunities for you to assume important roles in law firms or to work within industry as a qualified solicitor, undertaking work at a level that befits, and can only be performed by, a professionally qualified person. Finally, even if you are an LLM graduate, becoming a dual-qualified lawyer via the QLTS will undoubtedly complement your academic knowledge with practical skills and make your professional profile appealing both to law firms and your clients. 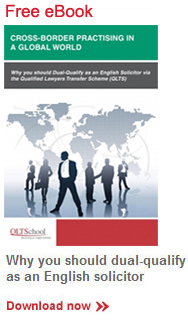 Whether you are newly qualified as a lawyer or a senior partner in your country of residence, whether you plan to live in London or remain in your home jurisdiction, or wherever you are qualified as a lawyer – becoming a dual-qualified English solicitor via the QLTS will provide you with more legal knowledge, unique practising skills and an outstanding professional profile. It will also offer you a remarkable opportunity to hold one of the most prestigious titles in the legal profession – an English solicitor.